Higher education funding has been a hotly-debated topic in recent times, with the RAB charge – the government subsidy inherent in the student loan system – a prominent focus of these debates. On the back of new research published today, researchers at the Institute for Fiscal Studies argue that this focus comes at the expense of a wider discussion around how much the government should subsidise the higher education system as a whole, and how best to deliver this. The new report has re-examined the current funding system for undergraduate higher education, highlighting its uncertain public finance implications. It also provides new estimates of the financial consequences of a series of reforms to the system of undergraduate funding, which have been proposed by various interested parties, and offers a first look at the likely costs associated with several potential ways to implement the new postgraduate loan system, announced by the Chancellor in his final Autumn Statement of the parliament. The funding of undergraduate higher education works as follows. Universities receive tuition fees from students and teaching grants from the government. Tuition fees are capped at £9,000 per year. Students do not have to pay these fees up front; they are entitled to government-backed loans to cover the full cost of their tuition fees and a contribution towards their living expenses. Students from poorer families are also entitled to grants to help cover their living costs while at university. The loans taken out by students incur a real interest rate of RPI+3% whilst they are studying, and a real interest rate of between 0% and 3% once they have left university, depending on their income. Individuals do not start making repayments until their income rises above £21,000. They must repay 9% of their income above this threshold, and continue doing so until their loan is fully repaid or for 30 years, whichever comes first. Any outstanding debt that remains at this point is written off. 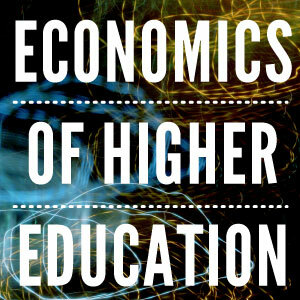 The overall cost to government of undergraduate higher education comprises two elements: the certain up-front costs associated with teaching and maintenance grants; and the uncertain long-run costs associated with issuing student loans (the RAB charge). The latter can, of course, only be estimated at this stage, as they will depend on student loan repayments for decades to come. Moreover, estimating these costs requires us to make a number of assumptions about things such as future earnings growth and the discount rate, which is a way of accounting for the fact that money paid in future is less valuable to the government than money paid now. What is clear from our analysis is that the discount rate matters hugely when estimating the cost of higher education. In fact, it matters more than plausible changes to the rate of real earnings growth. Reducing the discount rate means valuing future repayments more highly; hence the estimated loan subsidy (and the RAB charge) falls. But note that nothing ‘real’ has changed. No additional repayments are being made; we have simply changed how highly we value these future repayments in the present. The current debate has focused heavily on whether the RAB charge is ‘too high’. The fact that the RAB charge would fall from 43% with a discount rate of RPI+2.2% (the standard government assumption) to 30% with a discount rate of RPI+1.1% (the long-run median of real index-linked bond yields over the last decade or so) means that the assumption made about the discount rate is a key driver of this debate in a way that is perhaps not particularly illuminating given the important broader questions about the overall level of government subsidy. Freezing the income level above which repayments are made (currently £21,000) and the interest rate thresholds (currently £21,000 and £41,000) in nominal terms for seven years, and then uprating them in line with inflation (rather than earnings growth, as expected under the current system). Making graduates liable for repayments based on their total income (rather than their income above £21,000) once their income passes this threshold. A move to a ‘pseudo’ graduate tax, in which all graduates pay 9% of their income above £21,000 for 35 years (not just until they have covered the costs of their education). The current system is progressive: higher-income graduates repay more than lower-income graduates. That has obvious consequences for attempts to reduce the cost to taxpayers. Reforms that raise more money from graduates in total, whilst retaining the form of a genuine loan system in which graduates don’t pay back more than they borrowed, tend to hit lower- to middle-income graduates hardest. This is the case for the threshold freeze and total income proposals we consider. The alternative is to try to extract repayments from the richest graduates that are bigger than the loans they originally took out, as would be the case under the ‘pseudo’ graduate tax we have modelled. Such systems would be very sensitive to the income and loan take-up behaviour of a relatively small number of individuals. This trade-off is highlighted in Figure 1, which splits graduates into 10 equally-sized groups (deciles) on the basis of their lifetime earnings and illustrates how much we expect graduates in each decile to repay, on average, under each of these scenarios relative to the default 2012 system. The report also explores the implications of the recently-announced Labour proposal, in which the cap on undergraduate tuition fees would fall from £9,000 per year to £6,000 per year (but university income would be replaced by teaching grants); the maximum interest rate incurred on student debt would rise from RPI+3% under the 2012 system to RPI+4%; and maintenance grants would increase. The Labour proposal differs from the others in that it does not seek to reduce the cost of higher education borne by taxpayers but to reduce the cost borne by graduates. It would decrease the amount that is loaned out to students (and hence the long-run cost to government of issuing student loans), but substitutes this uncertain long-run cost with a known up-front contribution in the form of higher teaching grants. Because some graduates are expected to repay their loans in full under the current system, this policy would increase the overall taxpayer contribution to higher education. Moreover, because higher-income graduates are the most likely to repay their loans in full, the policy effectively benefits higher-income graduates the most. The first is similar to the current undergraduate loan system, with repayments of 9% of income above £21,000, but with this threshold frozen in nominal terms for five years and with an interest rate of RPI+3% charged to all postgraduates (regardless of income). The second assumes individuals repay 9% of their income between £15,000 and £21,000 per year. The third assumes that graduates are liable for repayments based on their total income (rather than their income above £21,000) once their income passes this threshold. Assuming postgraduate loan repayments are paid concurrently with undergraduate loan repayments, we estimate that all of these systems could operate at essentially zero cost to the government. Moreover, these estimates are relatively impervious to what happens to real earnings growth or which graduates decided to take out a loan. This is because the vast majority of postgraduates are expected to repay their loans in full, and to do so relatively quickly, mostly because they would borrow considerably less than undergraduates. If the size of the postgraduate loan on offer were scaled up substantially, then the costs might start to escalate (and the uncertainty increase). This may be relevant when considering the design of the £25,000 loans for PhD students proposed in the Budget. The subsidy inherent in the student loan system now comprises a substantial proportion of the overall government subsidy of undergraduate higher education. It is thus perhaps inevitable that debates about whether the loan subsidy is too high will continue. But it is important to remember that this is only one (highly uncertain) element of government support for higher education, and having so much of the debate focused solely on how much the government is likely to subsidise student loans misses the wider issue of how much the government should be subsidising higher education full stop. There are several reasons why the government might want to subsidise higher education, including the fact that there are benefits for the economy beyond those realised by individual graduates, such as higher tax revenues, and having a more productive or healthier workforce. However, choosing the appropriate level of subsidy and targeting it efficiently is fraught with difficulty. A more open discussion about how much subsidy should be provided, for whom, and how much certainty we would like to have over the numbers would be welcome.